Your vocal chords are warmed up, you’re on your second drink, and it’s long past time to start belting out the lyrics to your favorite karaoke tunes. 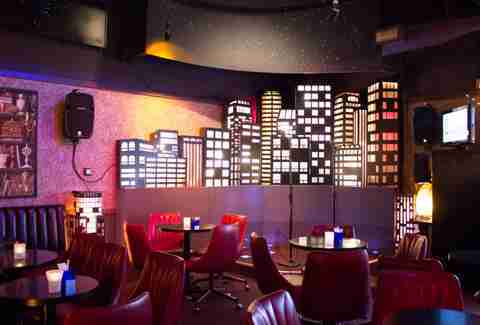 Lucky for you, San Francisco has karaoke for every kind of songbird. Cozy up in a private booth or mend your broken heart by making the whole bar weep as you warble -- however you want to soak up that sweet sweet spotlight, there is an instrumental track waiting for you. Channel your inner superstar as you belt out a range of classic and modern jams at this diamond in the rough. This cozy bar is tucked away in the Kinokuniya Mall and feels like you’re in a friend’s exceptionally snazzy living room, with comfy seating that surrounds an awesome lit-up cityscape backdrop. With over 120,000 songs available, including tracks in Chinese and Japanese, you can easily put together your ideal karaoke list. The crowd is warm and supportive and the vibe is thoroughly festive, with lots of applause and sing-a-longs. If you’re ready to take the main stage, this is your best bet. And at $2 a song you can save your money for the full list of fun cocktails, as well as wine and sake by the glass and bottle. The party keeps going until 2am on weekends, and 1am on weekdays. 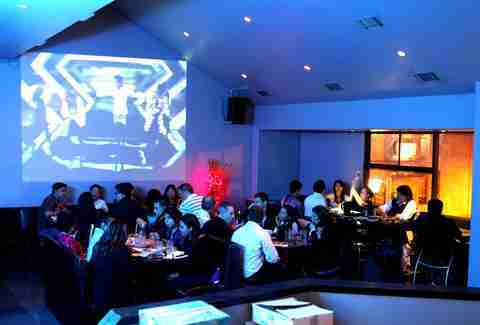 Get your crew together and enjoy sleek glass karaoke rooms outfitted with traditional tatami mat seating. Let's call this set-up swanky-semi-private: You have your own space to eat, drink, and karaoke, but glass walls let you show off a little too. Rooms are available for parties of 12 or 15, and the slick minimalist interior and out-of-control menu makes it the perfect spot for your next celebration. Feast on fresh sushi and classic Japanese dishes like yakitori, nabe, and donburi. Oysters fans can indulge in daily dollar oyster specials. All these incredible eats are best accompanied by endless rounds of sake, and Sakesan delivers on its name with a tremendous sake menu, available by the bottle. Dust off your dancing shoes and warm up your pipes as DJ Purple accompanies your favorite tunes with live saxophone solos during weekly Dance Karaoke night. Pair your karaoke and dancing antics with a full menu of Southern and soul food-style eats (the kitchen is open until 11pm), guaranteed to soak up your last round of courage-inducing cocktails. 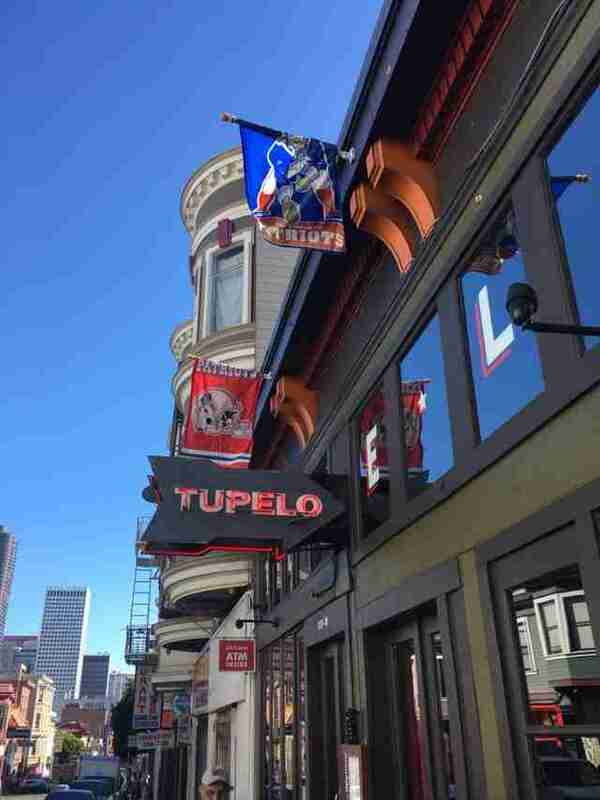 The big open space and projectors showing the lyrics turns this into a raging sing-and-dance-a-long, and you should definitely help power Tupelo SF’s riotous dance floor with your karaoke vocals until 1am. 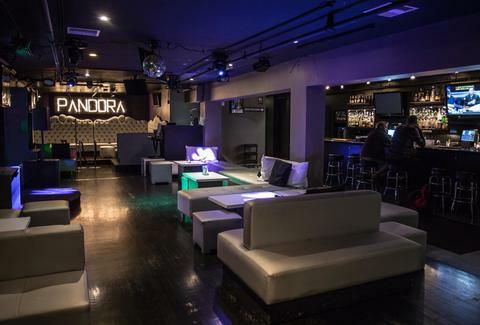 Skip the DJ hijinks and become your own personal karaoke DJ guru as you hole up in one of the legendary themed rooms at Pandora Karaoke & Bar. Match your room to the ideal tone of the night, from booze to sports. Multiple microphones and a private cocktail server are the perfect accompaniments to your personal karaoke abode, which can host between 15 and 25 people. Get set up with bottle service, or you can order cocktails, beer, and wine by the glass. Touch screen karaoke makes it hella easy to navigate the wild world of songs. Weekends at Pandora are a blast, but you can also splurge on some affordable weekday happy hour karaoke by checking out Pandora’s 50% off special from 6 to 8pm, Tuesday through Friday. Ready to show off your inner rockstar? Skip the private rooms and belt it out in the lounge. Got the Sunday night blues? Banish them, beer-in-hand, at heartbreak karaoke. Get ready to wail your saddest songs at your favorite neighborhood bar -- bonus points for crooners who make the bartenders cry. Have a heartbroken puppy who wants to do a howling solo? 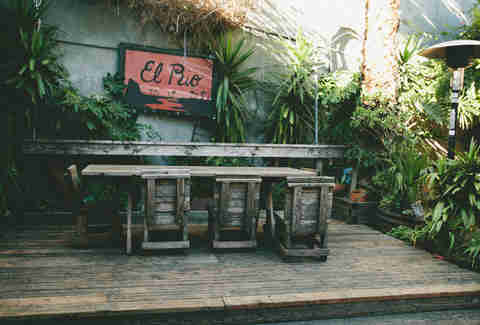 El Rio is a dog-friendly bar, complete with an awesome outdoor area to grab some fresh air after bringing tears to everyone’s eyes. Make a full day of it and hit up the Bloody Mary Happy Hour from 1 - 5pm on Sundays before getting ready for karaoke at 8pm. Surrounded by shimmering lights, it’s time to let it all out and enjoy that sweet, sweet spotlight glow. 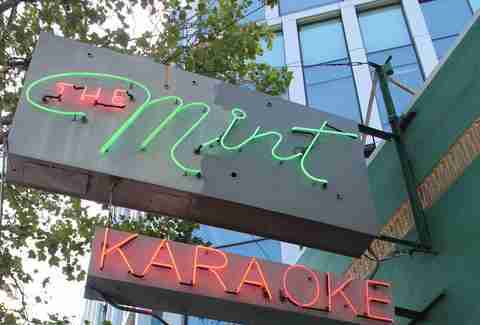 Karaoke at The Mint is an institution and the opposite experience of private booths. You’re up onstage, out in the open, surrounded by a (hopefully) pumped audience so make sure to come correct with song selections that you can crush, and lead a full on sing-a-long. Between the bar, the general excitement of the place, and the epic songbook, you can hunker down here until lights out at 2am and have a fully formed night. Be prepared and pick out your songs ahead of time with their online songbook. What makes karaoke even more delightful? A rollicking assortment of flavored sojus and a serious menu of homestyle Korean food to soak up your never-ending drinks. Playground features a private karaoke experience with rooms that can accommodate seven to 20 singers. Slurp a delicious carafe of soju cocktails spiked with lychee, aloe, cucumber, and more. The bar food menu lets you indulge in everything from perfectly crisp Korean fried chicken to sizzling kimchi-laced soups to a full menu of Korean bar snacks, the ideal accompaniment to your next round of carafes. 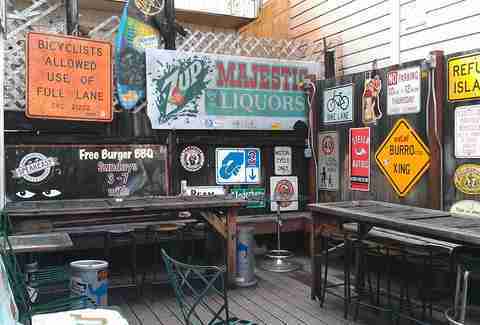 Benders is definitely not your average karaoke spot, but admit it -- haven’t you always wanted to indulge in some punk rock vocal stylings at this awesome neighborhood dive? Make your dreams come true on the last Friday of the month, when Lovely Eileen hosts Punk Rock and Schlock karaoke night. The songbook is huge, there’s no cover, and you can order a round of drinks and Benders’ legendary bar food while you wait. The best way to wrap up the month is definitely a big cheesy order of totchos (that’s right, tater tot nachos) and a full-bar punk rock sing-along. Where is a wild and maybe a little bit drunk rambler to go after 2am in the city that eventually sleeps? Town Music Karaoke is here for the night owls, and you can snag a private karaoke room until 4am Tuesday through Sunday. This is a strictly karaoke spot with a serious lack of frills, but it gets the job done when you suddenly need to blow off some steam singing loudly in the middle of the night. Feel the need shout out your favorite tunes after the world’s longest day of work? Rooms are 50% off between 7 and 9pm. Claire Margine will always join your karaoke sing-a-long. Send her your favorite songs on Twitter @cmoshenb and check out more of her work at http://ClaireMargine.com.